Sometimes a Surprise of The Month is not enough. It would just be too big of an understatement. Surprise of the Year would not be enough. 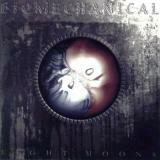 I had never heard a single word of a band called Biomechanical in my life. Then an avid reader here at MR informed me that theres this band that I might like. And sure enough I did and found out more about them (much luv for The FIST for the intro). This is their debut that was released in October of 2003 and I cant believe they haven’t had more publicity in the metal world, even though they have had extravagant reviews in almost every media I´ve seen to mention them. Over a half of seasoned metal veterans dont sound this good after several records, many dont ever sound this good, let alone on a debut. If MR had a Surprise Of The Millenium award, Eight Moons would easily take the cake. My colleague Shane said it best about this album. “Its like a supergroup of awesome metal sounds.” One cant put it more simply but effectively. Take the intensity and grooves of Pantera, the Crushing heavy sounds of Nevermore, the vocals and melodies of Judas Priest and Queensrÿche and the mellow emotions of Dream Theater and youre beginning to get a tiny grip of Biomechanical's world. The talent of this band is mindboggling. Vocalist John K can pull off Halford, Geoff Tate, Warrel Dane and Phil Anselmo in the blink of an eye. I didn’t think I would have ever said this, but there is a guy out there that can match the singing emotion and ramming power of Matt Barlow. I curse every infidel who isn’t impressed by that fact! The diversity frightens me. The guitarists, Jamie Hunt & Chris Webb throw riffs and atmospheric melodies that can pummel you like a sledgehammer tied to a tire iron or stun you still with beauty. The rhythm section of Jon Collins on bass and Matt C on drums throws one brutal backline to the mix. Matt is one human drum machine in his own right, having both a magical sense of style and technical skills equal of the Hoglans and Christys out there. The songs are so versatile as well, that I don’t know whether to mosh or cry. Ill do both. The opening tracks The Awakening and Do You Know Me groove like Pantera in their prime, with John screaming AND growling his lungs out while the guitars trade furious riffs and shamelessly melodic solos. The sounds on this album are also so awesome. Thick, meaty, dark and crystal clear, simply perfect. This album matches the atmosphere of Nevermores Dreaming Neon Black, which is an accomplishment on its own. Songs like Save Me and Eight Moons show the mellow-but-brutal sides of the band well, with acoustic guitars and grand orchestral parts thrown in for some good touching measure. Like I said in the beginning, It’s a whirlwind of awesome sounds and styles. All this is wrapped in a metal monster package of a unifying theme. It tells us of a quite depressed individual who hasn’t been that happy with his life and escapes into his own world, called Eight Moons. There, he morphs into this Biomechanical creature that basically crushes everything in its way and finally becomes a master of ones own life. It gives the awesome music the final, emotional and very compelling touch that defines a unique album. Prog, Power, Death, Aggro, Thrash, Hell, Its impossible for me to really define these guys to a genre. It sounds so futuristic on top of all of this, that it is as unique as it is marvellous. One genre that maybe could hold them in, would be called EXCELLENT! That’s as good as I can say it. There is only one bad thing I can come up with here. This album was released 6 months ago, so I dont know if I can include it in my top 5 albums of this year. Apart from that, sheer METAL! These guys have been recording their second album for the good part of 2004. I cant really wait to hear what is coming on that disc. This is one of the most…..no, THE most promising band of this new millennium. Biomechanical is the future of metal – literally.